Description: After consulting with medical professionals in a variety of facilities, we've designed a group of unique products that provide the particular benefits healthcare environments demand.Only Mannington Commercial manufactures coordinating soft and hard surface flooring.Since Mannington Commercial manufactures both carpet and resilient products, we can help with transitions from one area of the facility to another — saving time, money and effort. Mannington LifeCare® products come in an array of aesthetically pleasing styles and coordinating colors.LifeCare® ResilientPromotes safety. 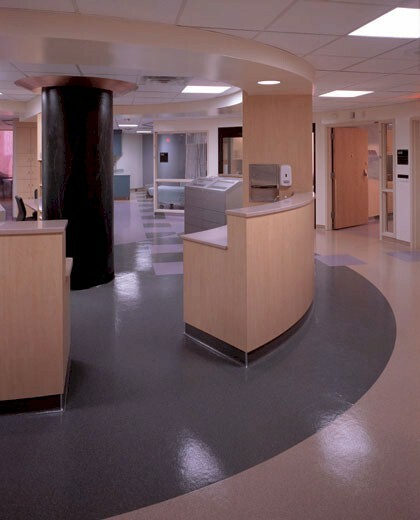 In corridors, patient rooms, operating rooms, entryways and ramps, a hard surface floor is usually preferred. LifeCare® slip-retardant sheet flooring brings an added measure of safety to acute care areas, offering exceptional traction when wet or dry. This patent pending surface also prevents dirt from being ground in, which saves on cleaning costs. Holds up under heavy rolling loads. For operating rooms and other areas with heavy rolling traffic, LifeCare® homogeneous sheet flooring is a rugged, durable choice. It won't split or crack, even under heavy rolling loads, and it resists stains, cuts and gouges. To soothe the eye, the flooring comes in low-contrast colors. Heat-welded seams protect the floor from germs and moisture. Is both stylish and durable. In doctors' offices and assisted care facilities that strive for a warm, residential look, LifeCare® resilient flooring is ideal. A durable, stain-resistant wear layer protects the floor's appearance, and an Aquabar® moisture barrier prevents discoloring due to mold and mildew.